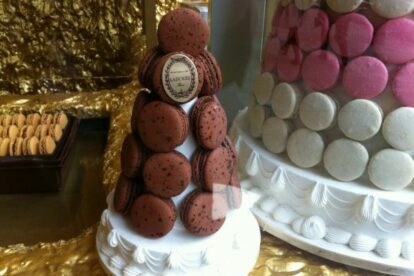 Macaron shops have been appearing over London for the last few years. These baked treats seem to be the new fashionable trend for those with a sweet-tooth. I have done my duty as a good Londoner (much to the disappointment of my dentist) and sampled a few macarons around town and my favourite is, without a doubt, those of Ladurée. This Parisian chain of confectionery shops has four stores in London (some other locations are in Cornhill, Harrod’s and Covent Garden). However I think the Burlington Arcade shop feels the most French. Just looking into the windows of Ladurée seems indulgent (much like looking at the neighbouring jewelry and cashmere shops in the arcade). The shop assistants are dressed impeccably, and the edible window decorations are sumptuous to behold and just oozes sophistication. The flavours of the macaroons cover a range from vanilla and pistachio to rose and Madagascar chocolate. They are pricey for their petite size (£ 1.75 each), but they are worth it once you bite into these pillowy pockets of sugar. There are also gift boxes to purchase which would make tasty presents for your friends. There is not much seating space, so I would recommend buying a selection of flavours and share them with a friend while promenading through Burlington Arcade. I guarantee that all of the Ladurée macarons will disappear by the time you finish your walk.